Someday I may be as tough as Roz Savage , but I doubt it. 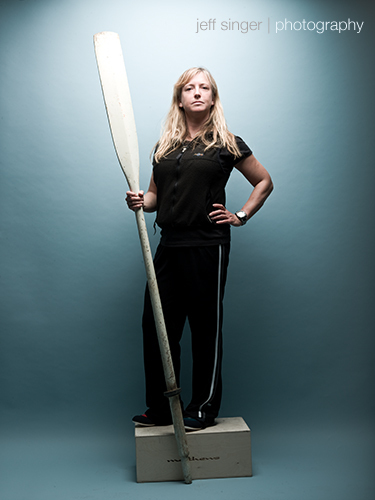 You see, Roz Savage is a 40 year old woman who can't be more than 5'2" tall, and as of today she is in the process of rowing from the San Francisco Bay to Australia. She will be the first woman to row solo across the Pacific Ocean.Come to think of it I'm not all that impressed... she is after all stopping in Hawaii. But, I'll cut her some slack. The trip to Hawaii alone is expected to take about 70 days. And, she is doing this all on her own with no "safety" boat staying close at hand. She will literally be in the middle of nowhere should anything go wrong.Strangely enough a couple days before I got the assignment to photograph Roz for 7x7 Magazine I went kayaking in the bay. I haven't been kayaking in years. Isn't it strange how things happen like that. Anyway, I didn't feel the need to mention it to her. I doubted she would have been too impressed considering after about 45 minutes of fighting a light breeze in the bay I had just about all I could handle. Hey, I didn't have the equipment she has. I'm sure I would have lasted at least an hour with her gear.On a side note, it seems like the issue of bottled water, which I wrote about last month is a popular topic these days. I was reading the New York Times this morning and read a new article about the backlash at people who drink bottled water. It was in the New York Times Style section, so I guess this means that if you don't drink bottled water you're stylish. They even mention that the cool new accessory is the reusable plastic Nalgene bottles. Hmm, I wonder if those fit in the Hummer cup holder?